You may have seen in my recent (and utterly frightening) post about going make-up free, that in the few years I’ve been wearing make-up almost every day I’ve seen a significant change for the worse in my skin tone and the amount of imperfections I have. In particular I have tiny little dots and dark circles under my eyes and generally miniscule bumps all over my skin and occasional patchy redness. I mentioned in that previous post that one of the ways I’m trying to overcome this is my wearing less make-up on a daily basis, in particular not wearing foundation every day. I’m also trying to improve my skincare routine generally and use good quality products. This has seen me spend a lot more than I usually would on skincare products over the last few weeks but I’m already starting to see some positive results. 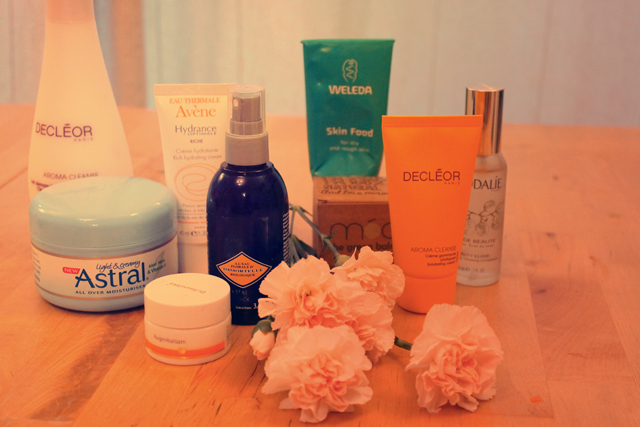 I thought I’d share with you my new bedtime skincare routine, as well as some of the products I’m really loving. 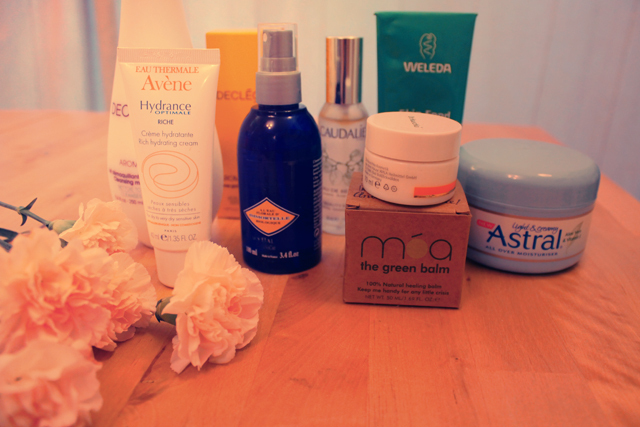 I first heard about Avene from Gem at From Gem With Love, via her ‘Winter Beauty‘ post. She recommends their Skin Recovery Cream (£11.25) and I loved the sound of their products but at the time was in desperate need of a new moisturiser so I picked up Hydrance Optimale Riche/Rich Hydrating Cream (£13.05) which can be used as a daily moisturiser. It really makes my skin feel really deeply moisturised and nourished and I’ll definitely be buying it again. I use this every morning as well as just before I go to bed. After falling in love with the moisturiser I bought I then happened upon a 19-piece sample set from Escentual that featured samples of their whole range of skincare products. I was £15 but came with a £15 voucher for you to then buy a full size product, so basically free! It’s come off their website now but I’m going to keep an eye out for it to see if it goes back on as it was such a good offer. In the meantime, apparently if you register with their website they periodically send out samples and they’ll also recommend you products based on a short skincare survey. 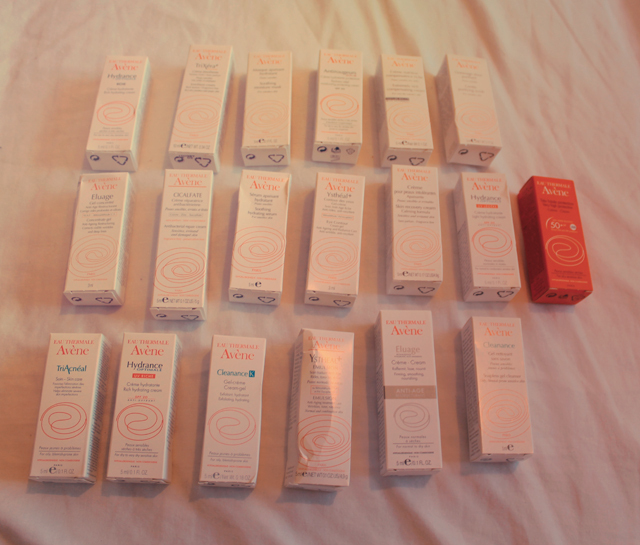 // what 19 avene samples looks like! You may remember that when I visited the Center Parcs spa last month I had a Decléor facial. As part of that the consultant recommended me some products and I’ve since picked up a couple, including their Cleansing Milk (£14.75) and Phytopeel Exfoliating Cream (£17.50). I use the cleanser every night before bed, and the exfoliating creme twice a week whilst in the bath. I picked up the L’occitane Essential Face Water (100ml, £6.50) a few weeks ago. I bought it from Feel Unique but had a really bad experience where the package took weeks to come and I couldn’t get hold of anyone to explain why. I won’t buy from them again but they do seem to have it at the cheapest price so I’ve linked to them anyway. I use this as a toner after using the Décleor cleanser. I already had a bottle of Caudalie Beauty Elixir (30ml, £9.35), lost it, replaced it with this one and of course found it the next day. I find the smaller size lasts ages anyway so I buy the smaller ones and keep them in my handbag and by my bed for a pre-bedtime spritz. in the morning rather than before bed (it’s not recommended for nighttime use apparently) but I think it’s worth a mention as it’s another item that I think is helping. It’s supposed to improve the tone and elasticity around your eyes and though it does feel a little oily I think it definitely is improving the dark circles under my eyes. Not facial skincare items but I must also give shoutouts to the Moa Green Balm (£9, 50ml) and Weleda Skin Food (£8.95, 75ml). I’ve been using both of these when my skin’s been feeling chapped or sore as a result of the cold weather. The Green Balm was also great for helping my tattoo heal and I pack Skin Food in my swimming bag to soothe my skin post-swim. Finally, I’ve also been really impressed with the Astral Light and Creamy All Over Moisturiser*. I was sent one to review a couple of weeks ago and I’ve been slathering myself in it when I get out of the bath. The Skin Food is quite a small tube so I use that for targeted moisturisation and the Astral Moisturiser for an all over soothe and moisturise (it has Aloe Vera and Vitamin E). It comes in a lovely tub so you can scoop it straight onto your skin and best of all is only around £4 in Boots and Superdrug. What are your favourite skincare products at the moment? Is there anything you’d recommend for my pre-bedtime routine?